Welcome to Music Friday when we regularly bring you amazing songs with jewelry, gemstones or precious metals in the title or lyrics. Today, we change up the criteria a bit to pay tribute to the opening of the Summer Olympic Games in Rio de Janeiro, Brazil. As thousands of athletes from around the world go for the gold we thought it would be a great time to feature Whitney Houston's "One Moment in Time," a pop anthem USA Today called "the gold standard by which all Olympic theme songs should be judged." A song that focuses on what it takes to reach the pinnacle of one's life, "One Moment in Time" became the theme song for NBC's coverage of the 1988 Summer Olympics in Seoul, South Korea. In rating it the best Olympic song of all time, USA Today noted that the lyrics perfectly define the spirit of the Games — working hard, overcoming setbacks, believing in oneself and ultimately becoming a champion. Putting the song over the top is Houston's Emmy award-winning performance. She sings, "Give me one moment in time / When I'm more than I thought I could be / When all of my dreams are a heartbeat away / And the answers are all up to me / Give me one moment in time / When I'm racing with destiny / Then in that one moment of time / I will feel / I will feel eternity." Written by John Bettis and Albert Hammond, "One Moment in Time" was released as a single from The 1988 Summer Olympics Album: One Moment in Time and charted in 17 countries, including a top-5 position on the U.S. Billboard Hot 100 chart. Bettis famously wrote "Top of the World" for the Carpenters and Hammond wrote and performed "It Never Rains in Southern California." Whitney Elizabeth Houston was born in 1963 in Newark, N.J. Her mom was an accomplished gospel singer and her dad was an entertainment executive. She was also a first cousin of singer Dionne Warwick. At age 11, Houston started performing in the junior gospel choir at her church, and throughout her youth was inspired by some of top names in the business, including Aretha Franklin, Chaka Khan, Gladys Knight and Roberta Flack. At age 20, she was signed to a record deal by Arista head Clive Davis. In 2001, she negotiated the biggest contract in music history: an eight-album deal worth $100 million. During her career, Houston amassed 200 million record sales and 11 #1 hits, including "I Will Always Love You." Houston died tragically in 2012 at the age of 48. Written by John Bettis and Albert Hammond. Performed by Whitney Houston. 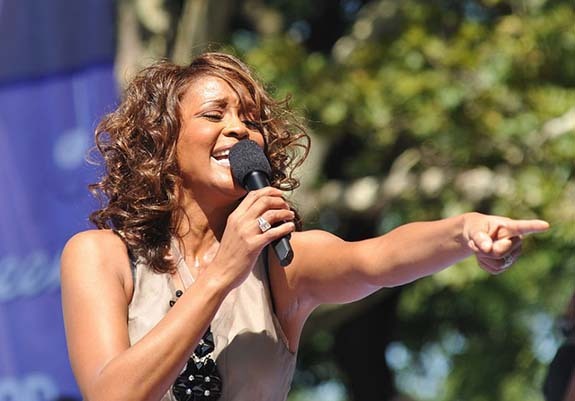 Credits: Whitney Houston photo by Asterio Tecson (Flickr: 111) [CC BY-SA 2.0], via Wikimedia Commons.